This living room swivel glider makes a casual and convenient addition to traditional styled homes. Combining comfort with the design style of traditional home furniture, this chair will comfort families with the ability to swivel in place and glide forward and backward. 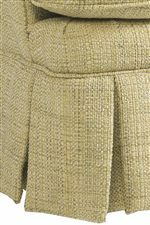 A plush "t" styled seat cushion and attached padded back add a flow of comfort to this chair's construction while a rolled back, arms and traditional styled skirt contribute to the classic styled fashion that graces its design. This chair is a perfect addition to living rooms as well as baby rooms and family entertainment spaces. 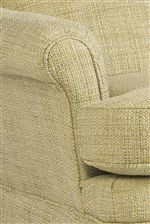 The Nava Casual Living Room Swivel Glider by Best Home Furnishings at Best Home Furnishings in the St. Louis, Chesterfield, St. Charles, MO & Waterloo, Belleville, Edwardsville, IL area. Product availability may vary. Contact us for the most current availability on this product. Browse other items in the Nava collection from Best Home Furnishings in the St. Louis, Chesterfield, St. Charles, MO & Waterloo, Belleville, Edwardsville, IL area.